Q. Do you have books to read for fun? The Berkeley College Library encourages students to read for pleasure in addition to the reading they do for class. 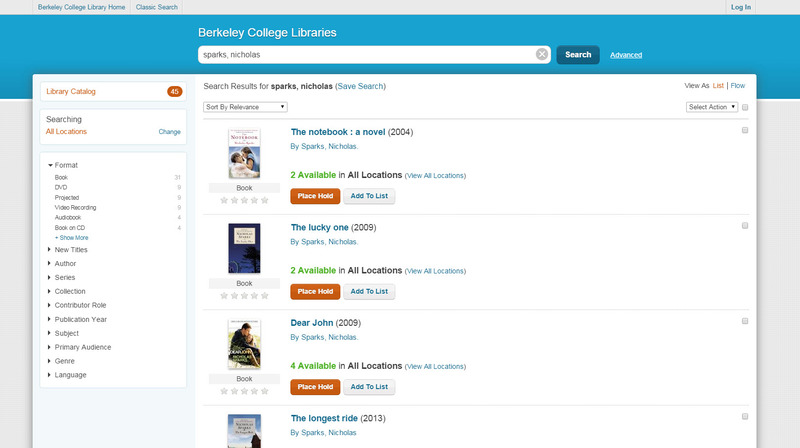 Search the Library Catalog for your favorite authors, fiction titles, and popular non-fiction titles as well. To put a hold on a title or request that it be sent to your campus, click Place Hold, and enter your library barcode (from the back of your Berkeley College ID) and PIN (last 4 digits of your student ID number) in order to have the book sent to your home campus. The library collections offer mysteries, thrillers, romance, urban fiction and more. In addition, we also have audio books. You can always ask a librarian for recommendations! See the videos below for more information on how to search the library catalog.